Hi! My name is Celeste Frohm and I welcome you to Starrdust Goldens and Havanese! We are located in Pittsford, NY just outside of Rochester, New York. Our family lives on 9 acres and consists of myself and husband, Mark. Children Jeff , Aaron and Rachel are all grown up! We share our lives with 4 Goldens, and 5 Havanese. 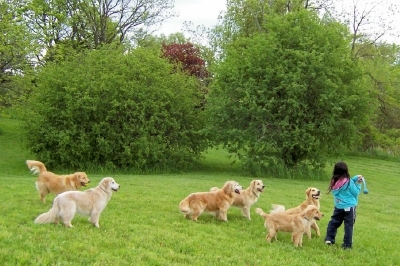 I grew up with Golden Retrievers and started training and showing them in obedience when I was 12 years old. In 2008 I decided I wanted to look for a small breed dog that I could have some fun with! I didn’t want a yappy, nippy breed-what I really wanted was a Golden Retriever in a small package. After much research and talking to breeders I decided on the Havanese breed. In August 2008 our beautiful Capri joined the family and we have not been disappointed! I have been breeding Goldens since 1987 and Havanese since 2011. I am a member in good standing of the Golden Retriever Club of America, the WNY Havanese Club and I am an AKC Breeder of Merit. I am a small scale, serious hobby breeder, dedicated to the wonderful Golden Retriever and Havanese breeds. My breeding program stresses temperament, trainability and intelligence. We usually have 1-2 litters available per year. Our puppies are raised in the house and receive lots of handling and socializing with kids as well as adults. They are exposed to a variety of noises, sights and experiences before going to their new homes. We give our puppy families lifetime support, guidance and insight. We feel that breeding is a total, lifetime committment to these wonderful puppies and their families. Please browse through the site. Items will be added regularly. And if you have any questions, please email or call.